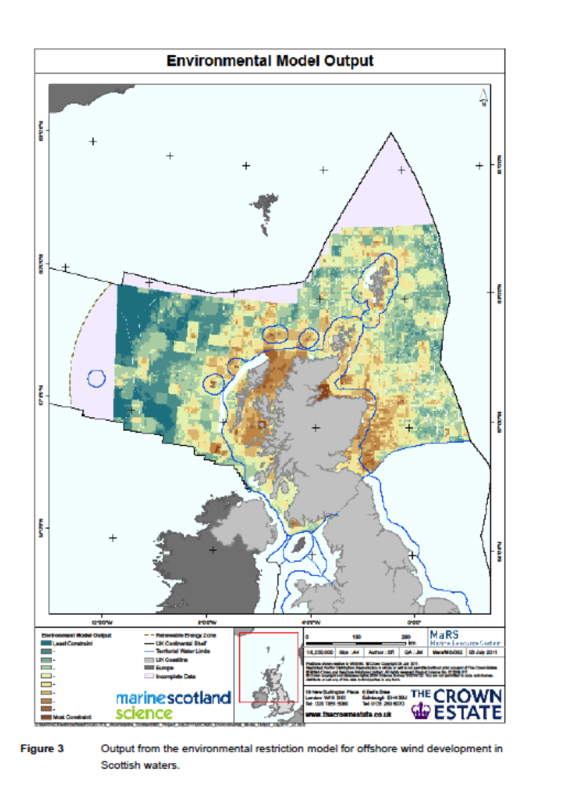 This report describes the process employed by Marine Scotland to identify strategic search areas for future commercial scale offshore wind developments in Scottish Territorial Waters (STW). It documents the development of the spatial analysis tools to support sectoral planning for offshore wind. How is planning for offshore wind energy undertaken in Scotland? How were constraints analysed spatially to inform sectoral planning for offshore wind in Scotland? How has the spatial analysis approach been tested and improved over time? The Scottish Government has set a range of challenging targets for energy and climate change. These recognise the potential to take advantage of the extensive marine energy resources (wind, wave and tidal power) available in Scottish waters and include meeting at least 30% of total energy demand from renewable sources by 2020, incorporating 100% of electricity demand from renewables (31% by 2011), 11% of heat demand from renewables and 10% of transport fuel from renewables. In addition, the Climate Change (Scotland) Act 2009 sets statutory targets of at least 42% emissions cuts by 2020, and at least 80% by 2050. To assist in meeting these targets, a Sectoral Marine Plan for Offshore Wind Energy in Scottish Territorial Waters (Blue Seas - Green Energy) sets out the Government's vision for developing offshore wind energy up to 2020 and beyond and has identified short term development sites for offshore wind up to 2020, with a potential to deliver almost five Gigawatts (GW) of electricity generation capacity; and a further 25 areas for further exploration beyond 2020. Currently, up to 10GW of planned development is in progress at offshore wind sites in Scottish Waters, divided roughly equally between Round 3 sites and sites in Scottish Territorial Waters (STW). This report outlines the process of analysis of spatial data which informed the development of the Sectoral Plan. Outline the method used to evaluate the potential for further offshore wind development in Scotland. Describe how the method has been updated to enable improvements to the approach. A sensitivity analysis of the process used to develop the Sectoral Plan concluded that, as additional data and monitoring information, and improved data handling procedures, become available, these should be incorporated into the emerging iterative marine planning process, as applied to the medium term options for wind farm development in Scottish Territorial Waters, and to opportunities further offshore. Estate to develop a series of new offshore wind plan options within STW, and presents the first discussion of development potential outside STW out to 200 nm. The Crown Estate spatial modelling tool MaRS was used to create multi-factorial expressions of the technical opportunities and constraints on offshore wind development in Scottish waters, and of the constraints on consenting presented by themed groups of 2 factors. These themes reflect current commercial (industrial) activities such as fishing, aquaculture and offshore oil and gas, environmental factors such as designated Natura sites, and a broad field of “heritage” interests including recreational uses, archaeological potential, visual and landscape factors. These models have been combined and used to develop overall expressions of the relative degrees of constraint. The sensitivity of the process was investigated through the creation of a series of combined models altering the relative influence of each the themes. Considerable similarities were found between the combined models, and the model that weights the three themes equally was taken forward and used to develop plan options for offshore wind within STW. This report documents the strategic planning for offshore wind in Scotland; it may be of material relevance to countries who share a border with Scottish waters and may be of methodological interest to other countries developing spatial planning tools to analyse overlapping constraints and identify development potential.